FOR IMMEDIATE RELEASE—St. Cloud, Minn. (May 16, 2016) — Electrical Builders, Inc. (EBITM); the nation’s premier specialty industrial electrical and welding contractor for the power generation and oil and gas industries was recently presented with the Above and Beyond Award in recognition of their extraordinary support of employees serving in the U.S. Guard and Reserve by the ESGR (Employer Support of the Guard and Reserve), a Department of Defense office. The Above and Beyond Award is presented by ESGR State Committees to recognize employers at the local level who have gone above and beyond the legal requirements of the Uniformed Services Employment and Reemployment Rights Act (USERRA) by providing their Guard and Reserve employees additional, non-mandated benefits such as differential or full pay to offset lost wages, extended health benefits, and other similar benefits. The award is given in limited numbers by state committees to employers who have also been recognized with the ESGR Patriot Award. 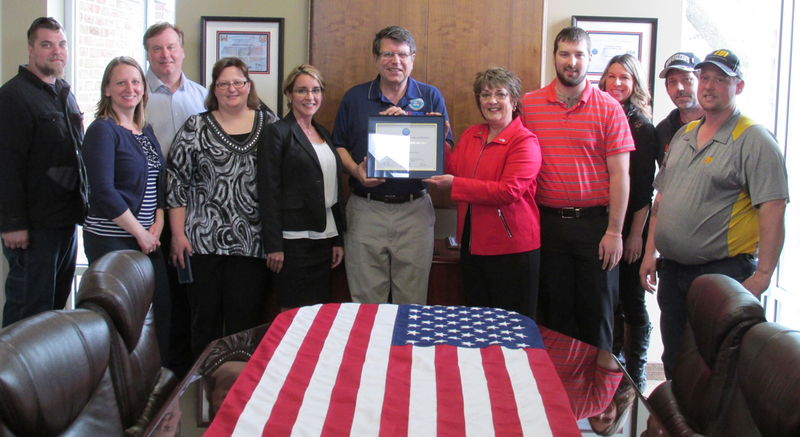 EBI’s CEO and Veteran, Constance Netter, was presented with the Patriot Award in December of 2014 after being nominated by an employee who served in the Minnesota National Guard and was called to active duty to support Operation Enduring Freedom. The employee was stationed in Afghanistan for over a year and shortly after taking some time off to get re-acclimated to civilian life, returned to work at EBI. The Above and Beyond award was presented to EBI by Marty Breaker, COL (R), MN Region 4 ESGR chair. For more information about ESGR visit www.ESGR.mil. To learn more about Electrical Builders, Inc. and their continued support of the US military click here.